November 6, 2013 at 3:00-4:00 p.m.
A dynamic speaker, Judge Raker will recount her 30 years chairing the committee producing the popular Maryland criminal and civil pattern jury instruction books. 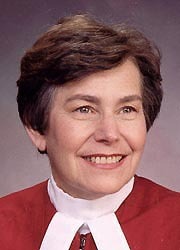 The Honorable Irma Raker, a distinguished jurist and legal pioneer, was the second woman appointed to the Maryland Court of Appeals. She currently chairs the MD Access to Justice Commission and works in private mediation. An open Q-and-A session about her illustrious legal career will follow the talk. RSVP to Kate Martin at kmartin@mcccourt.com, 240-777-9121.